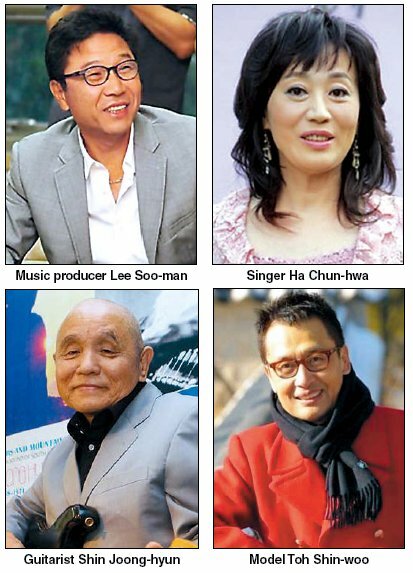 Six leading entertainers including music producer Lee Soo-man and veteran singer Ha Chun-hwa were awarded cultural medals by the Korean government on Monday in recognition of their contribution to Korean pop culture. Twenty-seven others received commendations by President Lee Myung-bak, the prime minister and culture minister during the award ceremony held at the Korean Pop Concert Hall at Seoul Olympic Park. The Culture Ministry and the state-run Korea Creative Content Agency declared the fourth Monday of November “pop culture artists’ day” last year, awarding artists selected through an evaluation by an independent team of experts. This year’s orders of cultural merit went to Lee Soo-man, the founder of SM Entertainment which produced TVXQ and Girls’ Generation, veteran actor Shin Young-kyun, singer Ha Chun-hwa, guitarist Shin Joong-hyun, television writer Yoo Ho and voice actor Oh Seung-ryong. Presidential commendations went to singer Kim Gun-mo, actor Lee Byung-hun, filmmaker Hong Sang-soo and singers-turned-producers Park Jin-young, who also heads JYP Entertainment, and Yang Hyung-suk, head of YG Entertainment. Veteran model Toh Shin-woo, head of Model Center, received the commendation in the model category. Girls’ Generation, actor Yoo Dong-keun and movie producer Shin Chul received the prime minister’s citations, while comedian Kim Byung-man, actors Jang Keun-suk and Song Il-gook received awards from the culture minister. Guitarist Shin Joong-hyun, singer Kim Gun-mo and other musicians performed during Monday’s ceremony, held 6 p.m.